The Council for Accreditation of Counseling and Related Educational Programs (CACREP) is the top accrediting board for graduate level counseling programs. 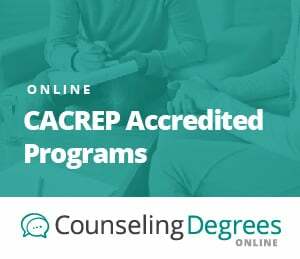 This guide walks you through the top Online Counseling Programs that are CACREP-accredited, as well as what CACREP requires when accrediting a program, commonalities across programs, and different modalities or concentrations for CACREP accredited counseling degrees. 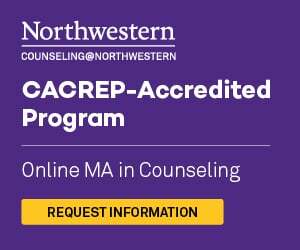 Note that CACREP currently only accredits Master's and Doctoral programs in counseling. As you learn more about what may be required of you throughout your college experience, you may find that CACREP can also be a lasting resource to assist you with finding reliable and reputable degree programs to choose from along the way. Our team of educational experts has thoroughly reviewed CACREP counseling accreditation compared to other accreditation agencies in order to provide you with detailed information you can use to determine whether or not you are choosing the right program. Before you dive deep into some of the popular accredited programs, you should consider what type of programs you might be looking for in a degree program. Some students may choose to pursue their degree through traditional means, while others may have a stronger attraction to programs that can be completed entirely online. Accreditation can be found in both traditional and online programs, making this decision an easier one to make for upcoming professionals that may wish to become licensed in the future. In order to make you journey towards the perfect degree program a little easier, our team of educational experts has reviewed the list of accredited degree programs through this website and provided a few examples for you to review below. Check out some of the most popular programs currently available to choose from. The Council for Accreditation of Counseling and Related Educational Programs (CACREP) is an accreditation agency that focuses on the need for improvement and innovation in counseling and related fields. This is the leading accreditation organization for educational programs in counseling, so it should be a familiar agency for you if you plan to pursue a degree within this field. Online degree programs that have been accredited by this agency should reflect the CACREP logo on their online program page and also be listed on the CACREP's approved provider's list. Accreditation agencies such as the CACREP may be geared towards consistent reviews of educational programs all over the country. There may be certain qualifications for upcoming programs seeking accreditation, some of which can likely be easily achieved through the creation of a thorough curriculum, qualified instructors, and up-to-date ethical and legal recommendations for upcoming counseling professionals. Take a look at some of the standards that may be reviewed during the accreditation process below. Finding a degree program that contains the right type of accreditation does not have to be a daunting task. Upcoming students that are seeking reliable degree programs can use different methods for achieving this goal. If you currently have a certain university in mind for your program, you can review the degree program's page on your school's website. Most degree programs that contain accreditation may list this information on the main page, or through a section pertaining to specific program accreditation. A quicker alternative for finding accredited programs in your area may be through the CACREP's search tool on the agency's website. Visiting the CACREP's website can lead you into more information concerning the actual process of accreditation, resources for upcoming professionals in the field, and lists of accredited institutions that may be offering online degree programs. At Our Lady of the Lake University's online Master of Arts in Counseling, you can learn to help students navigate the emotional terrain of primary or secondary school, empower people of all ages to overcome mental health challenges, or support someone recovering from addiction as they seek to rebuild their lives with the flexible Master of Arts in Counseling from OLLU. There are multiple specializations in School Counseling, Clinical Mental Health Counseling, and Clinical Rehabilitation Counseling. The desire to obtain a career in counseling may say a lot about your personality and your drive to help others. In order to meet this goal, there are certain requirements that must be met in order to become licensed to work with clients in the field. A Masters in Counseling may be the first step towards becoming a licensed counselor. Accreditation comes into play at this stage. Students that are seeking educational programs to take part in should review whether or not their program has received the right type of accreditation and whether or not that program could help you be eligible for licensure after graduation. Most states require that students obtain masters-level degrees that have been accredited by the CACREP. When you graduate from a counseling program and have completed your supervised work experience requirement, you may then be responsible for filing your application for licensure. During this process, you may be required to submit proof of degree acquisition so that your state department can review your achievement in order to deem you eligible for testing. If you want to ensure that your program can help you at this step, you should review your programs page on the school’s website or contact your universities enrollment specialist for more information. What About State Counseling Licensure? One of the biggest concerns for upcoming counseling students may be whether or not their program meets the minimum standards of their state licensure agency. This can be a valid concern for new masters-level students, since there are numerous for-profit educational programs that promote counseling programs that do not current contain the right type of accreditation to support licensure. Accreditation can be a complex task that requires effort from both the university seeking accreditation and the accreditation agency. As a student, your concerns with accreditation should be solely in whether or not your chosen degree program has received adequate accreditation and whether or not it can help you in obtaining your licensure. If you might be interested in learning more about what type of information a university must provide in order to become accredited, take a look at some of the frequently asked questions listed beneath this section. How is a program reviewed for accreditation? : The CACREP has a specialized method for determining whether or not a program in counseling should be deemed accredited. Universities that may be seeking accreditation can create a comprehensive report of their degree program, provide evidence as to why their program meets the minimum standard, and submit this information to the CACREP for review. The CACREP then reviews the application, assigns an on-site reviewing to visit the location, and awaits results. After an initial visit and review of curriculum and course work on-campus, a reflective report is then sent back to the CACREP for comparison. Review of these final documents can determine whether or not a program can receive accreditation. How long does accreditation last? : The CACREP currently accredits university’s degree programs for a period of 8 years. Programs that have applied for accreditation but still require additional information to meet the standards of the 8-year approval can receive a temporary accreditation status for 2 years. During that timeframe, universities are required to provide the additional information in order to remain accredited beyond the 2 year cycle. Is accreditation required for licensure? : In the U.S., all states require licensure before providing counseling services to the public. One main requirement for licensure of new counselors is proof of completion of a Masters degree in Counseling that currently holds accreditation with the CACREP. Degree programs that do not have proper accreditation at the time they were acquired may not be accepted during the licensure process. Master’s degrees in Counseling may be some of the most preferred options for upcoming college students interested in providing a needed service to their community. A Master’s in Counseling can provide students with higher knowledge and understanding of the human mind, emotions, and behaviors that can result as a combination of these factors. In order to provide people with support with emotional and behavioral issues, students must take part in an accredited degree program, become involved in 2-3 years of supervised experience, and complete a national test in counseling before becoming licensed. One of the most common questions about these steps may be concerning the accreditation of degree programs in counseling. Read more in the guide below to learn more about leading accreditation agencies in the U.S. and how they can assist you in getting the job you have always dreamed of.